Archaeologists searching for King Arthur’s round table have found a “circular feature” beneath the historic King’s Knot in Stirling. 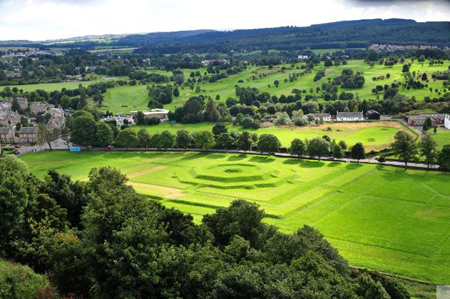 The King’s Knot, a geometrical earthwork in the former royal gardens below Stirling Castle, has been shrouded in mystery for hundreds of years. Though the Knot as it appears today dates from the 1620s, its flat-topped central mound is thought to be much older. Writers going back more than six centuries have linked the landmark to the legend of King Arthur. Archaeologists from Glasgow University, working with the Stirling Local History Society and Stirling Field and Archaeological Society, conducted the first ever non-invasive survey of the site in May and June in a bid to uncover some of its secrets. Their findings were show there was indeed a round feature on the site that pre-dates the visible earthworks. Historian John Harrison, chair of the SLHS, who initiated the project, said: “Archaeologists using remote-sensing geophysics, have located remains of a circular ditch and other earth works beneath the King’s Knot. Stories have been told about the curious geometrical mound for hundreds of years — including that it was the Round Table where King Arthur gathered his knights. Around 1375 the Scots poet John Barbour said that “the round table” was south of Stirling Castle, and in 1478 William of Worcester told how “King Arthur kept the Round Table at Stirling Castle”. Sir David Lindsay, the 16th century Scottish writer, added to the legend in 1529 when he said that Stirling Castle was home of the “Chapell-royall, park, and Tabyll Round”. It has also been suggested the site is partly Iron Age or medieval, or was used as a Roman fort. Extensive work on the royal gardens was carried out in the early 17th century for Charles I, when the mound is thought to have taken its current form. The first known record of the site being called the King’s Knot is from 1767, by which time it was being leased for pasture. Locals refer to the grassy earthworks as the “cup and saucer”, but aerial photographs taken in 1980 showed three concentric ditches beneath and around the King’s Knot mound, suggesting an earthwork monument had preceded it. The new survey — funded by Historic Scotland and Stirling City Heritage Trust — used the latest scientific techniques to showing lost structures and features up to a metre below the ground. It also revealed a series of ditches south of the main mound, as well as remains of buildings, and more recent structures, including modern drains which appear at the northern end of the gardens. Mr Harrison, who has studied the King’s Knot for 20 years, said: “It is a mystery which the documents cannot solve, but geophysics has given us new insights. Archaeologist Stephen Digney, who coordinated the project, said: “The area around Stirling Castle holds some of the finest medieval landscapes in Europe. “This investigation is an exciting first step in a serious effort to explore, explain and interpret them. The results so far suggest that Scotland’s monarchs integrated an ancient feature into their garden, something we know happened in other countries too. Dr. Kirsty Owen, Cultural Heritage Adviser at Historic Scotland, added: “The project has the potential to add to our knowledge of the landscape context of the medieval and early modern occupation of Stirling Castle. “The ditches identified may intriguingly be part of historically documented earlier garden features, or if prehistoric in origin could add to our scant knowledge of prehistoric activity at Stirling Castle. “We look forward to seeing the results of the next phase of investigations.”Futher work including a ground-penetrating radar survey, is now planned to take place next month to find out more. A small display of the interim results can be seen close to the site at the Smith Museum. 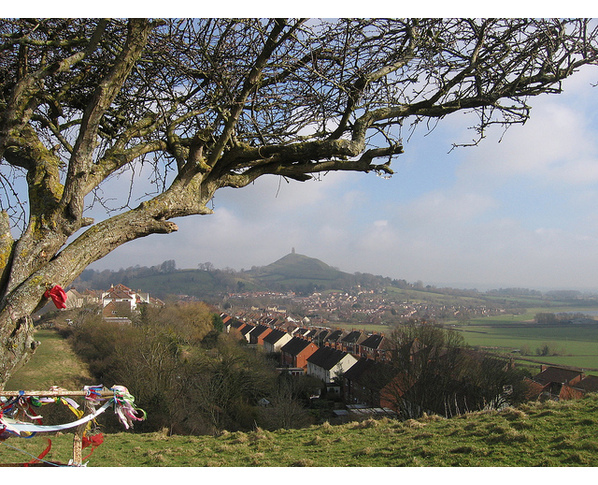 Glastonbury Legends and Myths – The legend of Joseph of Arimathea at Glastonbury, Somerset. to know where to begin to talk about them. There are two main streams of legend that surround Glastonbury, though they twine around each other to some degree. The two streams revolve around the romantic figures of Joseph of Arimathea and King Arthur. Let’s take them one at a time. Joseph was the Biblical figure who took Jesus’ body after the crucifixion. According to some legends he was actually Jesus’ uncle, and had visited Britain years before with Jesus in the pursuit of his interests in the tin trade. It appears that there actually was a strong Jewish presence in the west of England at that time, and many of the tin miners may have been Jewish settlers. At any rate, when Jesus died, Joseph thought it prudent to flee Palestine, and after many travails he came to Britain with a company of followers. He brought with him the Holy Grail, the cup used by Jesus at the Last Supper. Some versions of the legend have it that the Grail contained two drops of blood captured from Jesus’ side when he was wounded on the cross. When Joseph came to Britain he was granted land at Glastonbury by the local king. When he arrived at Glastonbury, Joseph stuck his thorn staff in the earth, whereupon it rooted and burst into bloom. A cutting from that first tree was planted in the grounds of the later Glastonbury Abbey, where it continued to bloom every year therafter at Christmas time. There is still a thorn tree in the Abbey grounds, of a variety native to the Holy Lands, and it does indeed bloom around Christmas time. Joseph was said to have established the first church in England at Glastonbury, and archaeological records show that there may well have been an extremely early Christian church here. What happened to the Holy Grail is another matter. Some legends have it that Joseph buried the Grail at the foot of Glastonbury Tor, whereupon a spring of blood gushed forth from the ground. There is a well at the base of the Tor, Chalice Well, and the water that issues from it does indeed have a reddish tinge to it, from the iron content of the water. Other legends have it that the Holy Grail was interred with Joseph when he died, in a secret grave. The search for the mysterious Grail emerges again and again in the tales of Glastonbury. Further legends tell that the church founded by Joseph continued for many years. Eventually it became a monastery, and one of the first abbots was the future St Patrick, who was born in the west country. Legends of King Arthur swirl about Glastonbury like a tantalizing fog from the nearby Somerset marshes. The nearby hill fort at South Cadbury has long been suggested as the location for Camelot. Indeed, excavations of South Cadbury suggest that it was in use during the early 6th century, which is the likeliest era for the real Arthur to have lived. The association of Arthur and Glastonbury goes back at least to the early Middle Ages. In the late 12th century the monks of Glastonbury Abbey announced that they had found the grave of Arthur and Guinivere, his queen. According to the monks, an excavation found a stone inscribed “Here lies Arthur, king.” Below the stone they found the bones of a large man, and the smaller skeleton of a woman. The monks reburied the bones in the grounds of the abbey, where they were a very handy draw for pilgrims. The site of the grave can be seen today in the abbey grounds. Glastonbury Tor, the enigmatic conical hill that rises above Glastonbury, has been linked with the Isle of Avalon, where King Arthur was buried after his death. This isn’t so farfetched as it may sound, for a millennium ago the water level was much higher, and the tor would indeed have been an island. Avalon was also called “the isle of glass” which does suggest similarities to the name “Glastonbury”. 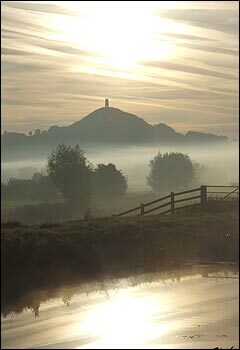 The Holy Grail, the object of Arthur’s questing, is said to be buried beneath Glastonbury Tor, and has also been linked to Chalice Well at the base of the Tor. One final myth of Arthur at Glastonbury: the landscape around Glastonbury is said to have been moulded and shaped so that the features (such as roads, churches, and burial mounds) create a zodiac calendar replete with Arthurian symbology. Like so many of the Arthurian myths, so much is open to interpretation and your own predisposition to believe or disbelieve. Is there a place more steeped in legend and myth than Glastonbury? Probably not. Legend holds that the earliest church here was founded by St. Joseph of Arimathea in about 60AD, and that when he planted his staff in the earth a thorn tree burst forth. In the grounds of the ruined Benedictine monastery there is a thorn tree of a variety common to the Middle East which is given to bloom around Christmas time. By the late Middle Ages Glastonbury had become the richest abbey in England, due to the heavy pilgrimage trade. It was rich enough to build an inn for well-to-do pilgrims (the George Inn, on nearby High Street, which still welcomes guests 500 years later). The best preserved building in the abbey grounds is the old Abbot’s Kitchen (see photo), a curious square building which appears round due to its octagonal roof. In the abbey grounds are the reputed graves of King Arthur and Queen Guinevere, which were conveniently discovered by the Glastonbury monks in the 12th century, when the abbey needed a financial boost. Outside the grounds are the abbey tithe barn, which now serves as the Somerset Rural Life Museum (well worth a visit), and 4 miles away at Mere is the abbey’s Fish House, were fish was salted and cured. The abbey is entered through the Abbey Gatehouse an imposing arched gateway located on off Magdalene Street. Visitors pass through a fascinating museum depicting life at Glastonbury during the Middle Ages, and then enter the Abbey grounds proper. The first building you see on entering the grounds is St Mary’s Chapel, a roofless structure that boasts wonderful architectural details, from the recessed arches of the door to the repetitive arcading that rings the interior. Look up, where the curious small towers at each corner of the chapel seem almost Georgian in style. If you continue past the chapel you will soon reach the Abbot’s Kitchen, probably the most recognizable symbol of the Abbey, and subject of numerous postcards! This is a peculiar building, with a high octagonnal tower over a square base bedecked with gargoyles. The interior is notable for the very large ovens and the high dome supported on reed-thin vaulting ribs. Return from the Abbot’s Kitchen towards St Mary’s Chapel and you will pass a small sign on the green lawn. This marks the old burial ground, where, in the 12th century, monks conveniently found bones beneath an engraved stone indicating the burial place of legendary King Arthur. The bones and those presumed to belong to Arthur’s queen, Guinivere, were reburied within the Abbey Church, where a small memorial can be seen. The grounds of Glastonbury Abbey emanate a sense of calm and peace; it is truly a magical place, and taken as a whole with the other attractions of this ancient town, make Glastonbury well worth an extended visit. Join us on a private guided tour of the West Country. 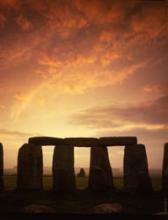 Visit Glastonbury, Stonehenge and Avebury Stone Circle. The weather may not be anything to write a postcard home about – but the West’s tourism industry enjoyed a twin boost yesterday. Key visitor attractions featured prominently in the first global TV adverts for a decade and new research showed up to 17 million Brits will holiday at home this year. VisitBritain, the national tourism agency, yesterday unveiled its international TV campaign to attract overseas visitors to the country. The adverts will be screened around the world, and include Stonehenge, Glastonbury and the Cotswolds. Stonehenge is already in the spotlight because of the summer solstice, and VisitBritain say the UNESCO World Heritage Site is one of the most important prehistoric monuments on the planet. As well as the 5,000-year-old site, there are money Neolithic and Bronze Age monuments in the surrounding landscape, and Avebury, the largest stone circle in Europe, is nearby. Glastonbury is synonymous with the annual music festival taking place at the weekend, with international superstars such as U2, Coldplay and Beyonce, as well as theatre and circus performers and much more.but VisitBritain also point to the ruins of Glastonbury Abbey, and the iconic Tor, along with myths and legends about the Isle of Avalon, King Arthur, Joseph of Arimathea and the Holy Grail. Historic sites include Sudeley Castle and Chedworth Roman Villa, while VisitBritain urges tourists to sample local produce such as Gloucester Old Spot pork, Tewkesbury mustard and the famous Cotswold cheeses. Other locations in the TV adverts include London landmarks such as the Houses of Parliament and St Paul’s Cathedral, the Lake District, Snowdon in Wales, Edinburgh Castle and the Highlands. Celebrities such as actress Dame Judi Dench, fashion icon Twiggy and chef Jamie Oliver – who has restaurants in Bath and Bristol with another opening in Cheltenham this summer – star in them. The campaign kicks off a major marketing push that seeks to build on the global impact of the Royal Wedding, with the Olympics next year also guaranteeing the international spotlight. It will concentrate on the current most important tourism markets, such as the US and Western Europe, and the big growth areas for the future, including China and India. VisitBritain chief executive Sandie Dawe said: “This is our first global TV campaign for 10 years and marks the start of an ambitious marketing programme. With the eyes of the world on us, we have an opportunity to showcase Britain and then to close the sale with great travel deals and offers from our partners. Meanwhile a new survey has found nearly 40 per cent of Britons will stay at home this summer as families strive to balance household finances. Many of them will instead enjoy ‘staycations’, with the West sure to cash in. Visiting Britain ? Visit the West Country! As a Christian symbol, it seems appropriate that its resurrection took place in time for Easter. 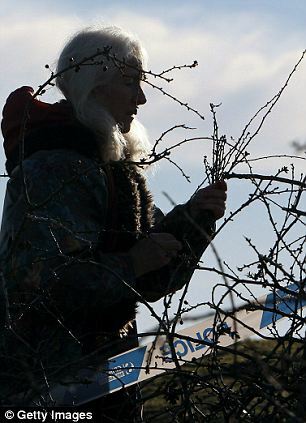 Glastonbury’s Holy Thorn tree began to show new buds this week, three months after it was savagely cut down by vandals. According to legend, Joseph of Arimathea – who some say was Jesus’s great-uncle – travelled to Wearyall Hill after the Crucifixion and stuck a wooden staff belonging to Jesus into the ground before he went to sleep. When he awoke, the tale goes, the staff had sprouted into a thorn tree, which became a shrine for Christians across Europe. 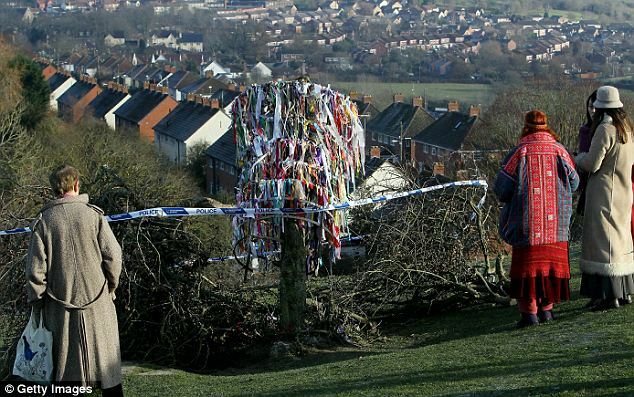 Every year, the sacred tree flowered once at Christmas and once at Easter, until just before Christmas last year when it was vandalised, leaving the community of the small Somerset town fearing it was dead. But that was before the council enlisted the help of Peter Frearson, a self-titled pagan wizard who happens to run his own horticultural business. Mr Frearson said: ‘Well-meaning but uninformed people were putting things like marmalade on the wounds. ‘Mead, an alcoholic drink made from honey, was also popular, as well as various ales and Guinness on one occasion. But Mr Frearson, nicknamed the Garden Wizard, had other ideas to ensure the tree’s revival. He said: ‘We applied a dressing of pine resin and beeswax to stop further moisture and rain getting in, keep out bacteria and fungus, and applied nutrients. ‘We covered it in horticultural fleece, then bubble wrap, then more fleece. ‘Soon after we replaced the bubble wrap with hessian. Glastonbury’s mayor John Coles said the display of new buds on the tree was ‘wonderful news for the town’. Visit the ;Holy Thorn’ on a Glastonbury (King Arthure Country) guided sightseeing tour. A film is set to be made by Hollywood producers on the Glastonbury legend of Joseph of Arimathea and the Holy Thorn. The £50m-budget film Glastonbury: Isle of Light is set for release in 2012 and has been written and produced by Daniel McNicholl with Galatia Films. In December the Holy Thorn on Wearyall Hill was cut down by vandals but efforts are being made to re-grow it. The legend relates to Joseph who planted Jesus’s staff into the ground on Wearyall Hill 2,000 years ago. A tree grew, and it is believed the hawthorn sprouted from a cutting of the tree. It is one of several Holy Thorns planted around Glastonbury. Daniel McNicholl said: “This is a British story so I think it needs to be told through British landscape. “We want ancient Glastonbury to be shot in places like the Isle of Man, Ireland, Wales, and Somerset. The film producer has said he was aware of the Holy Thorn being vandalised which he described as “punch in the gut” but believes the tree will re-grow successfully. Avon and Somerset police are still continuing their enquires and a reward of £200 has been offered by the town council for more information. Vandals have destroyed one of the most celebrated Christian pilgrimage sites in Britain and chopped down a tree said to have sprouted from the staff of Joseph of Arimathea 2,000 years ago. 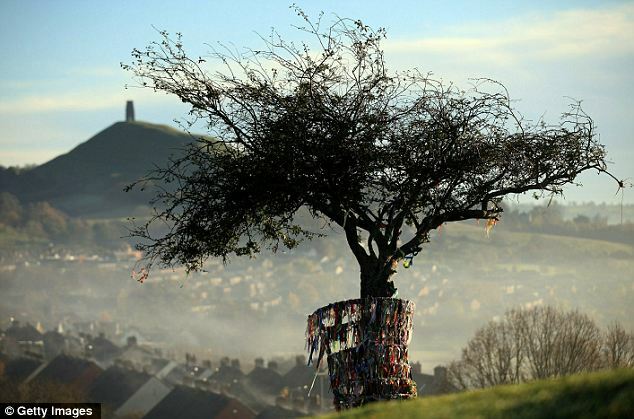 The Holy Thorn Tree of Glastonbury, Somerset, is visited by thousands every year to pay homage and leave tokens of worship. Those visiting today were moved to tears on finding the tree cut to a stump. The sacred tree is unique in that it blossoms twice a year – at Christmas and Easter – and sprigs taken from the thorn are sent to The Queen each year for the festive table. Christian legend dictates that Jesus’s great uncle, Joseph of Arimathea, came to Britain after the crucifixion 2,000 years ago bearing the Holy Grail – the cup used by Christ at the Last Supper. He visited Glastonbury and thrust his staff into Wearyall Hill, just below the Tor, planting a seed for the original thorn tree. Roundheads felled the tree during the English Civil War, when forces led by Oliver Cromwell (pictured) waged a vicious battle against the Crown. However, locals salvaged the roots of the original tree, hiding it in secret locations around Glastonbury. It was then replanted on the hill in 1951. Other cuttings were also grown and placed around the town – including its famous Glastonbury Abbey. Experts had verified that the tree – known as the Crategus Monogyna Bi Flora – originated from the Middle East. A sprig of holy thorns was taken from the Thorn tree by Glastonbury’s St Johns Church on Wednesday and sent to the Queen. Avon and Somerset Police have launched an investigation after locals found that vandals had hacked off the branches of the iconic tree. They were dumped next to the trunk which is protected by a metal cage. 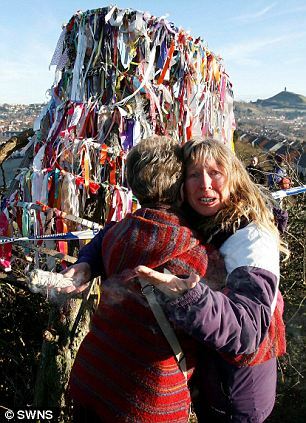 Locals wept openly today at the foot of the tree, on the town’s Wearyall Hill opposite its world-famous Tor as they struggled to contain their emotion. Katherine Gorbing, curator of Glastonbury Abbey, said: ‘The mindless vandals who have hacked down this tree have struck at the heart of Christianity. ‘It holds a very special significance all over the world and thousands follow in the footsteps of Joseph Arimathea, coming especially to see it. ‘It is the most significant of all the trees planted here and can be linked back to the origins of Christianity. ‘When I arrived at the Abbey this morning you could look over to the hill and see it was not there. Glastonbury Mayor John Coles rushed to the tree site after he heard the news. Mr Coles, 66, said: ‘I’m stood on Wearyall Hill looking at a sad, sad, sight. The tree has been chopped down – someone has taken a saw to it. ‘Some of the main trunk is there but the branches have been sawn away. I am absolutely lost for words – I just do not know why people would want to do this. When one thinks of Wiltshire the images which spring most readily to mind are the spacious rolling downland of Salisbury Plain and associations with pre-history which are at their most stunning at Avebury and Stonehenge. Whilst Wiltshire is more complex than this a journey northwards to the Marlborough Downs will reinforce this picture of sweeping chalk downland and ancient times. Here, there is also the handiwork of more recent history, in the famous Wiltshire White Horses. There are now eight of them and they have their own newly opened long distance path, ‘The White Horse Trail’. The Vale of Pewsey and Savenake Forest, part of the Kennet District, offer a complimentary landscape which also has many enjoyable walking opportunities; and the Kennet and Avon canal, joining the two rivers, provides delightful waterside rambling through peaceful rural countryside. South of Salisbury Plain the Wylye and Nadder river valleys offer lovely walks, once again through a quiet rural landscape a million miles away from the hustle of industrial Swindon in the north of the county. 100 Walks in Wiltshire by: Various contributors. An omnibus of local walks covering the whole of Wiltshire. The book is ideal for family outings and as a valuable reference book for residents and visitors to the region. There is a wide choice of routes with perhaps two thirds spread over the northern part of the county. Salisbury Plain is not well represented, but this is largely due to Ministry of Defense activities, which do not co-exist well with peaceful country walking. However all the best parts of Wiltshire are covered. The walks vary in length from 2 to 12 miles, the majority being in the 4/6 mile range. Sketch maps and route descriptions are on facing pages. Walks in Mysterious Wiltshire by: Laurence Main. Discover Wiltshire’s secret places. Wiltshire has long been associated with both historic and prehistoric sites, most notably Avebury and Stonehenge. See and experience these for yourself and contemplate their significance as temples, secular monuments or ancient observatories. Many more mysteries await walkers in this historic area; white horses carved on Wiltshire’s hillsides, sites of ancient battles, neolithic burial sites and a network of ley lines, those ancient trackways often associated with spirit pathways. There are stories of Wiltshire’s witches, folklore traditions, Arthurian legends and even UFO’s! These are just some of the prospects offered in 27 well planned routes of interest to all the family. Waterside walks in Wiltshire by: Nick Channer. The 20 circular routes in this book are all between 2 and 9 miles in length. Each walk instruction also includes details on how to get to the start by car, where to park, and what food and drink are available locally. For greater clarity, the route descriptions are divided into numbered paragraphs, which correspond with the numbers on the accompanying sketch maps. There are also seperate sections about places of interest to visit nearby. From walks near Heytesbury, once the home of war poet Siegfried Sassoon, the Vale of Pewsey and the National Trust village of Laycock to Salisbury’s watermeadows and Devizes’ flight of 29 canal locks, this book provides the walker with many interesting and exhilarating hours in the open air. 50 Walks in Wiltshire by: David Hancock. 50 themed walks of between 2 and 10 miles, each with fascinating background reading, clear, easy-to-follow route descriptions and detailed sketch maps. Locations include: Chute Standen; Great Bedwyn; Savernake’s Royal Forest; Wootton Rivers; Ramsbury; Clarendon; Amesbury; Avon Valley from Downton; Pepperbox Hill; Vale of Pewsey and Oare Hill; Salisbury; Lydiard Park; Great Wishford; Till and Wylye Valleys; Fyfield Down; Old Sarum; Avebury; Barbury Castle; Cricklade; Dinton and the Nadder Valley; Ansty; Wardour Castle; Ebble Valley; Bowood Park; Bremhill; Heytesbury; Devizes; East Knoyle; Fonthill; Tollard Royal; Roundway Hill; Holt; Castle Combe; Lacock; Bowden Park; Malmsbury; Sherston; Box Hill; Stourhead; White Sheet Hill; Westbury White Horse; Corsham; Longleat Estate; Bradford-on-Avon; Frome Valley; Bath. Ten Walks in West Wiltshire by: RA West Wilts Group. All are circular and they vary in length from 4 to 11 miles. Locations are as follows: Bradford on Avon – Little Ashley (6km); South Wraxall – Stonar School – Little Chalfield (8km); Warminster – Arn Hill – Upton Scudamore (9km); Holt – Staverton – Whaddon – Broughton Gifford – Great Chalford (10km); Brown’s Folly – Farleigh Wick – Monkton Farleigh (10km); Westbury – Upton Scudamore – Old Dilton (11km); Steeple Ashton – West Ashton – Yarnbrook (13km); Bradford on Avon – Westwood – Freshford – Farleigh Hungerford – Avoncliff (13km); Bratton – Bratton Castle – Edington (14km); Nockatt Coppice – Bidcombe Wood – Cold Kitchen Hill – Brimsdown Hill ( 18km). Walking in West Wiltshire Book 2 by: RA West Wilts Group. The ten walks in this booklet have been devised and written by ten members of the group. Accordingly the descriptive narratives show a variety of different styles. For ease of use a detailed sketch map is shown opposite each walk description with the route clearly highlighted. Paragraph numbers in the description are shown on the maps at relevant points. This guide allows you to share in the discoveries of experienced ramblers with good local knowledge. The walk starting locations are as follows: North Bradley (8.5km); Semington (8km); Trowbridge (9km); Bradford on Avon (9km); Steeple Ashton (6.5km); Thoulstone (9km); Kingston Deverill (11.5km); Shearwater (10km); Melksham (10.5km); Heytesbury (7km). Walking in West Wiltshire Book 3 by: RA West Wilts Group. In this book members of the RA West Wilts Group have devised a further ten interesting and enjoyable walks using their local knowledge and experience. For ease of use a detailed sketch map is shown opposite each walk description. Also highlighted are paths providing links with adjacent walks described in the book. The walk starting locations are: Edington (8.5km); Heytesbury (11km); Melksham (10.5km); Horningsham (10.5km); Bradford on Avon (11.5km); Codford (15km); Warminster (12km); Westbury (8km); Broughton Gifford (9.5km); Sutton Veny (15.5km). Somerset, Wiltshire and the Mendips Walks by: Brian Conduit. 28 routes colour coded for difficulty, varying from extended strolls to exhilarating hikes.The guide introduces you to the area and highlights the most scenic walks. OS Explorer mapping is included. Locations include: Nunney Combe; Nettlebridge and Harridge Wood; Devizes and Caen Hill Locks; Ilminster and Herne Hill; Langport and Muchelney Abbey; Salisbury and Old Sarum; Lacock and Bowden Park; Fovant Down; Old and New Wardour Castles; Avebury; West Kennett and Silbury Hill; Glastonbury; Lambourne Downs; Uffington Monuments and Vale of the White Horse; Ham Hill, Montacute and Norton Sub Hamdon; Cadbury Castle and the Corton Ridge; Hinton Charterhouse and Wellow; Bradford-on-Avon, Pewsey Downs; Stonehenge; Barbury Castle and Ogbourne St Andrew; Wells, Ebbor Gorge and Wookey Hole; Savernake Forest. Literary Strolls in Wiltshire ans Somerset by: Gordon Ottewell. 40 attractive strolls throughout Wiltshire and Somerset, each with a strong literary association. In Wiltshire, you follow in the footsteps of such remarkable people as multi-talented William Morris, architectural commentator Nikolaus Pevsner, war poet Siegfried Sassoon and Celia Fiennes, the pioneer travel writer. The walk locations include: Swindon and South Cotswold Area – Inglesham; Marston Meysey; Oaksey; Broad Town; Hodson; Barbury Castle; Bishopstone. Chippenham and Devizes Area – Kington St Michael; Kington Langley; Bremhill; Bromham; Broughton Gifford; Poulshot; Bishops Cannings. Salisbury and Warminster Area – Heytesbury; Steeple Langford; Hindon; Tisbury; Mere; Newton Tony; Pitton. Ten Walks Around Devizes by: Graham Hillier and Ron Wiltshire. 10 circular walks created with the intention of starting and finishing at the focal point of Devizes Town – The Market Place. There is much of interest to see on these walks including a visit to the site of the Civil War battle of Roundway Down; a stroll along Quakers Walk, once an elm lined avenue from Roundway Park to Devizes; the remains of Devizes Castle and a medieval deer park enclosure; several stretches along the Devizes canal and the sites of several macabre events desribed in the text. Other locations visited on the walks are Gypsy Patch, Roundway Hill, Hartmoor, Potterne Village, Potterne Woods, Drew’s Pond, Hillworth Park, Sleight and Stert, Consciences Lane, Rowde, Lower Foxhanger’s, and Rangebourne Mill. 11 Half Day Walks in North East Wiltshire by: North East Wiltshire Group – Ramblers’ Association. All the walks are around five miles in length so that only a morning or afternoon is needed to complete them. The walks are well described and sketch maps are included. The walks have been chosen to show the variety of countryside in the area. The walk locations are: Avebury and the Sanctuary; Berwick Bassett Common and Windmill Hill; Love’s Copse and Love’s Lane; Poulton Downs and the Railway Path; Wexcombe and Grafton Downs; Castle Hill and Stanton Fitzwarren; Hare, Aughton and Inham Downs; Hippenscombe Bottom; The Kennet Valley; The Ridgeway and Hinton Downs; Rivers Key, Ray and Thames. 20 Walks Around Swindon by: North East Wilts Group – Ramblers’ Association. This booklet describes 20 circular routes from 2 to 7 miles. Locations are: Cotswold Water Park; Highworth, Red Down and Hannington; Cricklade and Cotswold Water Park; Blunsdon, Stanton Fitzwarren and Kingsdown; Lechlade, Buscot and Kelmscot; Bishopstone, The Ridgeway and Ashbury; Liddington Hill and Downs; Chiseldon and The Ridgeway; Upper Upham; Chilton Foliat and Hungerford; Downs and Og Valley; Barbury Castle, Smeathes Ridge and Burderop Down; Manton and Fyfield Downs; Wootton Bassett, Little Park Farm and Wilts and Berks Canal; Clouts Wood and Elcombe; Peatmoor, Shaw and River Ray Parkway; Lydiard Park and Purton; Coate, Day House Lane and Greenhill; Coate Water and Broome Manor; Old Town Railway and West Leaze. 12 Walks Around Marlborough by: Bert Toomer. The walks in this booklet were devised to take you to the best vantage points in the area and to bring you back to your starting point. Locations are: Circular from Ramsbury; Aldbourne, Ewin’s Hill and Ramsbury; Baydon, Hodd’s Hill and Membury; Great Bedwyn, Wilton and Kennet and Avon Canal; East Croft Coppice; Ramsbury and Littlecote; Piggledene, Stony Valley and Devil’s Den; Marlborough and Mildenhall; Martinsell Hill, Draycot and Gopher Wood; Martinsell Hill, Kennet and Avon Canal and Wootton Rivers; West Woods, Gopher Wood, Knap Hill and Wansdyke; Milk Hill, Wansdyke, Tan Hill and Kennet and Avon Canal; Milk Hill, Wansdyke, Stanton St Bernard and Kennet and Avon Canal. Nine Downland Walks by: BertToomer. The collection of walks in this booklet will help you make the most of the fine countryside that lies between Swindon and Marlborough. Clear route instructions and sketch maps are provided. The walk locations are: Barbury Castle, The Ridgeway and Burderop Down; Upper Upham and Snap; Smeathe’s Ridge, the Ogbournes and Four Mile Clump; Chiseldon and Hodson; Rockley, Totterdown and Fyfield Down; Ridgeway Path, Shipley Bottom and Sugar Hill; Burderop Down and Smeathe’s Ridge; Hackpen Hill, Rockley, Totterdown and the Ridgeway; Ogbourne St. George, Whiteshard Bottom and Chase Woods. 8 Easy Walks Around Salisbury by: South Wilts Ramblers’ Association. This is a set of eight walk cards contained in a plastic wallet. Each card has a brief description of the walk, the starting point and a sketch map on the front and the route directions on the reverse. The walks are between 2 and 5 miles long. The walk locations are: Charlton All Saints and the River Avon; Godshill Enclosure and Millersford Circular; Breamore House and The Mizmaze; Bowerchalke and over Marleycombe Hill; Fovant Badges and Chiselbury Camp; Old and New Wardour Castles; Great Wishford, Grovely Wood and River Wylye; Battlesbury, Middle and Scratchbury Hills. 10 Short Walks Around Salisbury by: South Wilts Ramblers’ Association This is a set of ten walk cards contained in a plastic wallet. Each card has a brief description of the walk, the starting point and a sketch map on the front and the route directions on the reverse. The walks are between 4 and six miles long. The walk locations are: Salisbury to Old Sarum; Figsbury Ring and Winterbourne; East Grimstead, Bentley Wood, Blackmoor Copse, Farley; Pepperbox Hill and Barford Down; Charlton, Downton and Trafalgar House; Breamore and Whitsbury; Nunton and Odstock; Broad Chalke and The Ox Drove; Dinton, Compton Chamberlayne and Fovant; Great Wishford and Grovely Wood. 10 Longer Walks Around Salisbury by: South Wilts Ramblers’ Association. This is a set of ten walk cards contained in a plastic wallet. Each card has a brief description of the walk, the starting point and a sketch map on the front and the route directions on the reverse. The walks are between 8 and 13 miles long. The walk locations are: Old Sarum to Stonehenge and Amesbury; Around Downton; Woodfalls; Martin Down, Pentridge and Vernditch Chase; Downlands and Valleys; Swallowcliffe, Ansty and Alvediston; The Inner Chase; Old Wardour, Tisbury and Castle Ditches; Sherrington, Great Ridge Wood and Knook; Salisbury Plain and the Till Valley. Needless to say we feel its better to join a local guide to explore the area but if you are visiting the area then the books I have listed above may be of great use, enjoy!